At what point do we just call it space vandalism? In the past, I’ve written about the problem of space junk, and some of the suggested solutions to the problem. However, it seems that this month has been a good one for high profile space junk. There are two stories I wish to comment on. One is the news that an unauthorised CubeSat launch has taken place , and the other is the imminent re-entry of the Chinese Tiangong-1 space station . First up, the CubeSat. Silicon Valley start-up Swarm Technologies wants to use their SpaceBee CubeSats as the world’s smallest two-way communications satellites . Swarm Technologies created their satellites, applied for Federal Communications Committee (FCC) approval, and scheduled a launch. Then, something happened. They failed to get their FCC approval. The reason for this rejection was the size of these CubeSats. The SpaceBees should perhaps not be called CubeSats, but instead picosats. They are exist in that wonderful size range between 1x1x1cm and 10x10x10cm which makes them sizeable enough to do serious damages to other devices in space, but too small to effectively track. The FCC did not reject the launch for frivolous reasons, the presence of these SpaceBee picosats in space represented a serious risk to other space-based systems. Swarm Technologies decided that they wouldn’t let a small thing like safety get in their way, and continued with their launch. Despite the lack of approval, the satellites were launched on an Indian Polar Satellite Launch Vehicle by the Indian Space Agency in January. This launch appears to have been orchestrated by Spaceflight Industries, who have declined to comment on the matter beyond stating that the FCC is investigating. So, what happens now? Ultimately, not much can be done. These picosats are in space now, and cannot be tracked. Piling sanctions on to any of the involved parties will do nothing to remove the current risk to other space-based systems that these picosatellites represent. Who is to blame in this scenario? Swarm Technologies are of course the primary party to blame. They were told they could not launch, and it is hard to believe that they could have missed the reason as to why their launch was unsafe. How much blame should we place on Spaceflight Industries? Should they be responsible for examining the safety of each individual device that they organise the launch of? How far should this go? What if a satellite broke up during launch and damaged other structures? Should they have predicted this? How about the Indian Space Agency. Should they accept the word of the other two parties involved here when they say that the product to be launched is completely fine? Do they need to be manually investigating objects to be launched? What about the FCC- could they do more? Perhaps they should manually oversee launches of all US-created satellites. It is a conundrum. The problem is that once the launch has happened, we cannot do anything. We cannot undo the launch; all we can do is prevent future launches. As we ever approach a space environment with Kessler syndrome , it becomes increasingly important to prevent this from happening again. Does this desire put us at odds with the technological growth being spawned by humanity? Launching of a CubeSat has become increasingly financially viable. Pricing advice online varies wildly, but it seems that a CubeSat could be launched for around $40,000, and its cheaper cousin (the TubeSat) could be launched for as little as $8,000 . The launching of objects in to space is no longer strictly the business of nation states, as evidenced by Tesla’s recent successes. With this being the case, what can we do to stop people from launching items that are unsafe? Humans being humans, is there a risk of space vandalism- the deliberate launching of junk in to space for the purpose of causing annoyance. As with most problems that have the potential to cause massive damage, there is no easy answer. It seems that financial penalties may not be enough to put people off. Perhaps space littering should be criminalised, with perpetrators facing jail time? This would be a policing nightmare- there are so many different countries that people could be launching from, how would you bring all of them in to line? Do we need to form a special space policing organisation that sits across all countries? If humanity wishes to truly embark in to space, it seems that something along these lines may become a requirement. It will be interesting to see which terrestrial territory makes the first move towards such a creation. My next bugbear is the Tiangong-1 space station. This station has been replaced by the Tiangong-2, and so the decision was made that it should be deorbited. However, China has lost control of the station. There have been speculations for a while on when and where the space station may re-enter the atmosphere, but as the rough date approaches these estimates have become more accurate; the latest estimate being within a few days of the 31st March. This still doesn’t give too clues as to the location. The path of the stricken space station meanders over much of the Earth. Quite a lot of the Earth is of course ocean, and the station will almost certainly burn up in the atmosphere. That said, how much risk is acceptable risk when it comes to space management? There’s still a chance that some of the station will survive re-entry, and that some of this will then hit land. What if it did manage to kill a person, or destroy some property? Pieces of Skylab made it to land during re-entry, landing fairly safely in Western Australia . This was met with a jovial littering ticket. When the landing site is less predictable, it seems a bit less amusing somehow. Is re-entry a problem that should be considered when launching objects in to space? As I mentioned in my prior blog post on what can be done about space junk, a lot of systems are designed to re-enter the atmosphere at the end of their lifespans and safely burn up. Space stations are a bit larger than the average item to be launched in to space. What happens if, as happened to China, a country loses control of them? What repercussions could really be levied against such a nation? Do we just decide that this level of risk is acceptable in pursuit of the stars? Again, it is a conundrum. 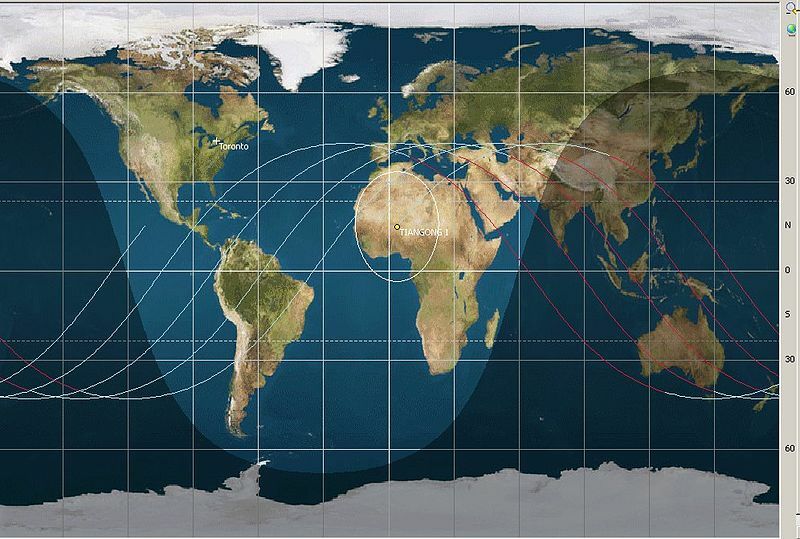 I will be closely watching estimates on the re-entry of the Tiangong-1 space station. If nothing else, it should provide some area of the Earth with an excellent light show.